Just so you know, I am crazy about being an American. I do love to travel, but am always anxious to be home in "the land of the free and the home of the brave." Though we have many, many flaws, I believe my country is a work in progress, just like me. Today, I watched my beloved land take one more baby step toward fulfilling its promise, by inaugurating a new president. The losers of the election sat quietly, without arms, and watched as the people's will was carried out. It always stuns me. It was serendipitous that this particular man would be sworn in on this anniversary of Dr. King's march on Washington, a mere 50 years ago. In the arc of time, this seems somewhat impressive to me. Though I must say, I missed the girls. Too few, if you ask me, were made prominent today. Because of this, I wanted to share this book with you. 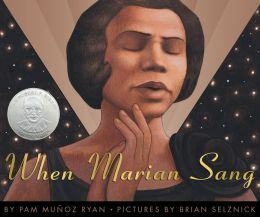 This picture book is a beautiful way to explore the career of Marian Anderson, an internationally acclaimed opera singer who was not allowed to sing in Constitution Hall in Washington D.C. in 1939. With the help of another capable woman, Eleanor Roosevelt, Marion instead sang to an integrated crowd of 75,000 from the steps of the Lincoln Memorial. She stood on the steps that would one day host Martin Luther King Jr., and in her own way, helped our country take a baby step. Picture books are wonderful for all ages. And, with the drawings of Brian Selznick of The Invention of Hugo Cabret fame, this wonderful woman and her accomplishments come to life. It is a must read, if you ask me!